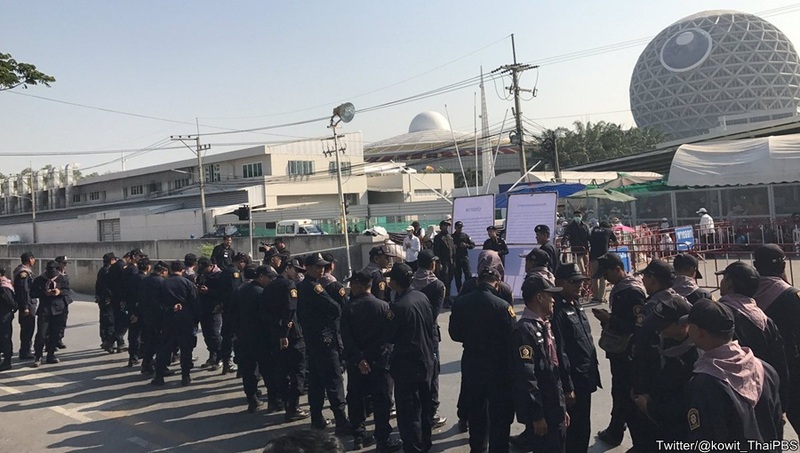 A combined force of 3,000 officials from the Department of Special Investigation (DSI), local administration officials, anti-riot police and soldiers conducted simultaneous predawn raids at the Dhammakaya temple in the last effort to arrest it's former abbot, Phra Dhammachayo. The raid came after the DSI proposed the prime minister to invoke Section 44 of the interim Constitution to enter, search and arrest Dhammachayo after the normal legal procedures could not be enforced to force the stubborn monk to surrender to face charges. Under the order under Section 44, the temple area and it’s vicinity in Klong Luang district of Pathum Thani are put under control and any entry and exit will be restricted. Troops sealed off the Klong 3 canal road where the temple Gate 4 is located at 3.00 am. Army patrol vehicles with lights flashing entered Gate 4 blocked and set up checkpoint to prevent any vehicles to leave or enter the temple. But nearby Gate 5, and 6, several hundreds of disciples and supporters continued to arrive and gather peacefully to pray. Meanwhile authorities used loudspeakers to persuade them to leave the temple with warning that any attempt to resist or obstruct authorities in performing their duties will face legal action. DSI officials are negotiating with the temple officials for permission to search suspected target where Phra Dhammachayo was believed to be staying. DSI director general Pol Col Paisit Wongmuang said negotiation was still on although over an hour has passed with no success. He said the prime minister has advised that the operation must be conducted in peaceful way and without any use of force. He said the court has permitted the officials to search the temple both day and night and for several days. Currently the temple has engaged in over 300 cases of forest intrusion with 70 of them involved with Phra Dhammachayo.